As many of you might know by now, my manager Kjetil Fluge and I have been cooperating with my Chinese agent Shandan Tong since 2013. Last year we was finally able to go on our first tour in this great country. And what a great experience! The kindness of the Chinese audience is indeed special, and I am so thankful for the opportunity to perform across China! We have now established a solid platform in China, and teamed up with some great people that will help us take the next steps. 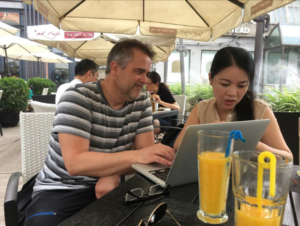 Kjetil was recently in Bejing, meeting among other our dear agent Shandan Tong. I am looking forward to go back and continue performing in China in the coming years.